Fourth and fifth graders have persuaded their Minnesota school to switch to LED lighting after assessing light usage and expense in a class project. The elementary students in Northfield's Prairie Creek Community School studied lighting and energy use in class for several months, including measuring current usage. As part of that work, they calculated how much the school could save if it adopted LED lighting inside and outside, according to reporting by Northfield News. The total: about a third less energy and $4,000 a year in energy bill savings. Armed with a grant, the school was able to do a retrofit. The students also created a video that documented the project, which they shared at a gathering of C.O.W.S., Conversations On the Wonders of Science, a local monthly gathering of people interested in hearing from science experts. "I think the C.O.W.S. 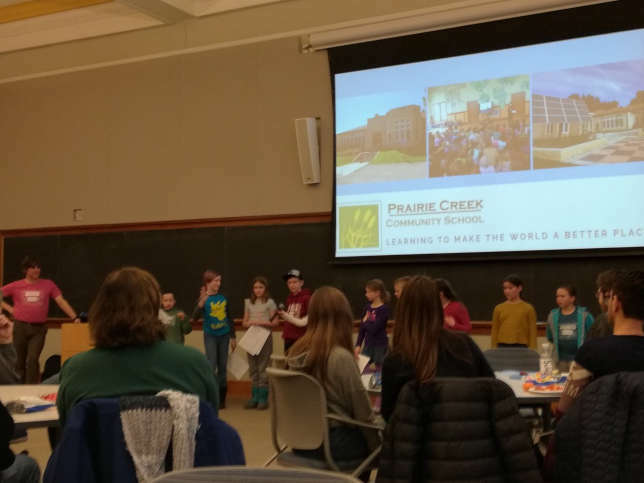 presentation was fun to do and I hope it made other people think about what they can do to help against climate change," said fifth grader Claire Vanorny, according to Reporter Anne Kopas.